I love sumac, and pomegranates, very much. Other things I love: m’sakhan and fattoush. The key ingredient in m’sakhan happens to be sumac, and fattoush is nothing without plenty of pomegranate molasses. But what really makes these dishes dear to me are the memories they evoke: the best fattoush I ever had was in Jubayl (aka Byblos), a coastal town in Lebanon. I was having lunch by the harbor with friends, sharing food, laughing, and drinking in the fresh sea air in a day’s escape from Beirut. The best m’sakhan I ever ate was with my family when we visited Jerusalem. For all its wonders, Jerusalem is a difficult place at best and the m’sakhan replenished our spirits as much as our bodies: the ultimate comfort food. 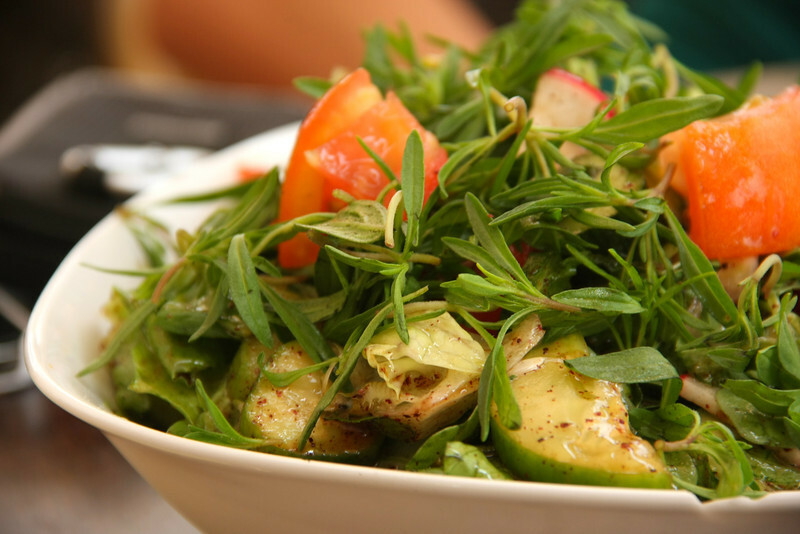 Lately I’ve been scouring the eateries of Cairo for decent fattoush, but after months of searching, I’ve simply failed to find any that I like. I’ve also been on a bit of a m’sakhan kick of late, having made it three times in the past week and continuously fed it to whomever shows up. These quests are a way, perhaps, to create comforts of home and community, to recover what has been lost or estranged, in a city that I love – but which, like all great cities, can be very lonely and overwhelming sometimes, too. And then it dawned on me: the bite and crunch of fattoush; the tang and warmth of m’sakhan: they were destined to be together. Call it culinary match-making, if you will: the gustatory wedding of flavors. The crispy bread and pomegranate tartness of fattoush laced across the slow-caramelized, lemony sweet sumac onions and chicken of m’sakhan – this is the stuff that dreams are made of. 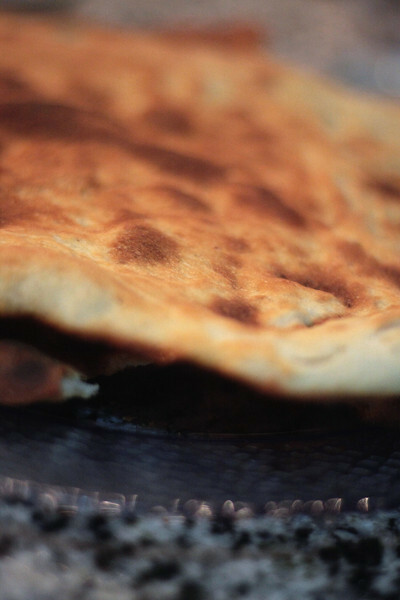 This recipe borrows from the recipe in Nancy Harmon Jenkins’ exquisite Saveur article on Palestinian food – namely with the bread recipe, which is simple, straightforward, and perfect. After that, it departs from the original significantly (the biggest departure is that the chicken is stewed tagine-style and whole rather than cut into pieces and roasted – which I did perhaps because I left a bit of my heart in Morocco, too). Put the yeast, sugar, and water in a mixing bowl and let sit for five minutes or so. Once it starts to foam, throw in the salt and flour, mix with a wooden spoon, and then knead for a few minutes. Cover with a thin coat of olive oil, cover with a dishcloth, and leave in a draft-free, warm spot to rise. 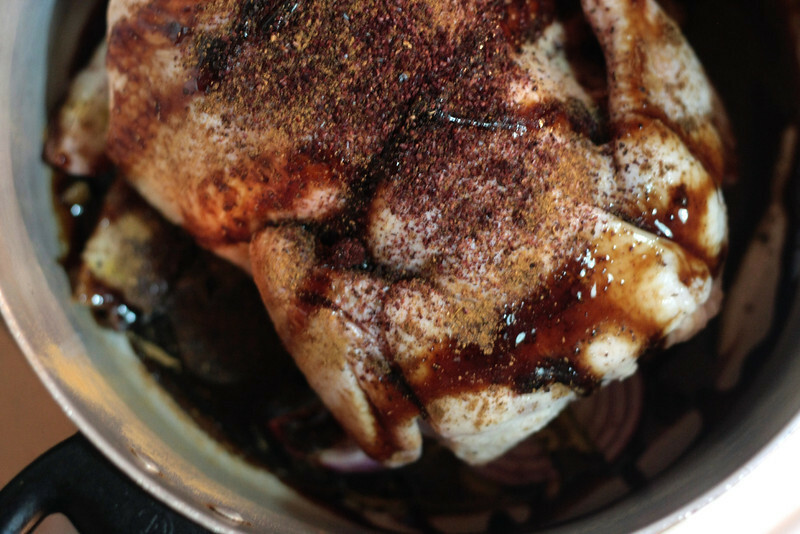 Meanwhile: place the chicken, half an onion (sliced), half the sumac, pomegranate molasses, cinnamon, and allspice, and generous shakings of salt and pepper into a large pot. Cover with water, about halfway up the chicken. Place on high heat until the water boils, then bring the heat back to low and cover partially. Let simmer for about half an hour. Flip the chicken over and add enough water so that the chicken is again half-submerged; simmer for an additional 30 minutes. Preheat your oven to 425 degrees F.
Place the rest of the onion, sumac, cinnamon, allspice, and pomegranate molasses in a skillet with a generous amount of olive oil and cook on low heat till they just start to caramelize. 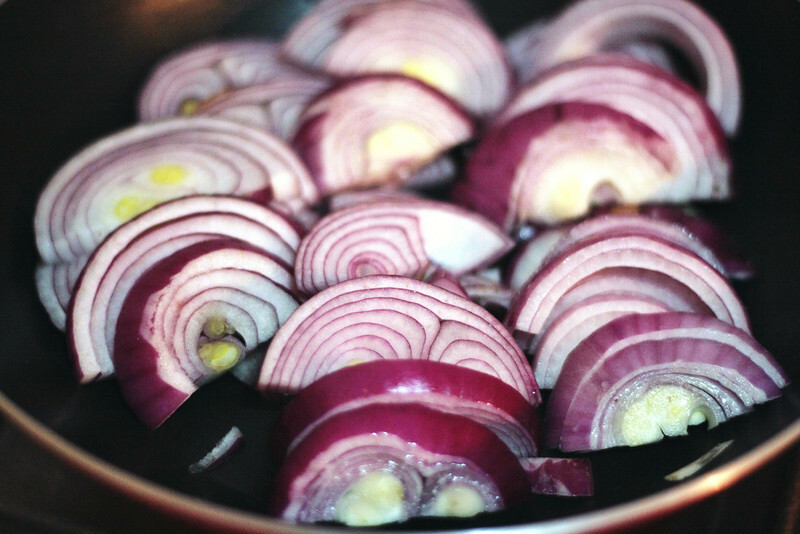 Stir often and check to make sure they aren’t burning; if they start to burn, just touch up the olive oil. Punch down the dough; divide into three, and roll each out as thinly as possible into a rustic round. Brush with a light coat of olive oil and place in the preheated oven. The trick here is to crisp the bread to somewhere between your typical m’sakhan texture and the crunch of the fried bread that is used to top fattoush. In my oven, this took just over ten minutes, but you’ll have to monitor it. Ideally you will be just able to snap off an end of the bread, but it’ll still have a hint of suppleness. After the chicken has been simmering for a full hour, remove the lid and allow it to simmer uncovered until the broth reduces and thickens slightly – this should take 10-15 minutes. Once the chicken is done, remove from heat but cover to keep warm. To serve, layer a serving platter with torn/snapped pieces of the bread. Ladle the broth from the chicken and drizzled pomegranate molasses over this. 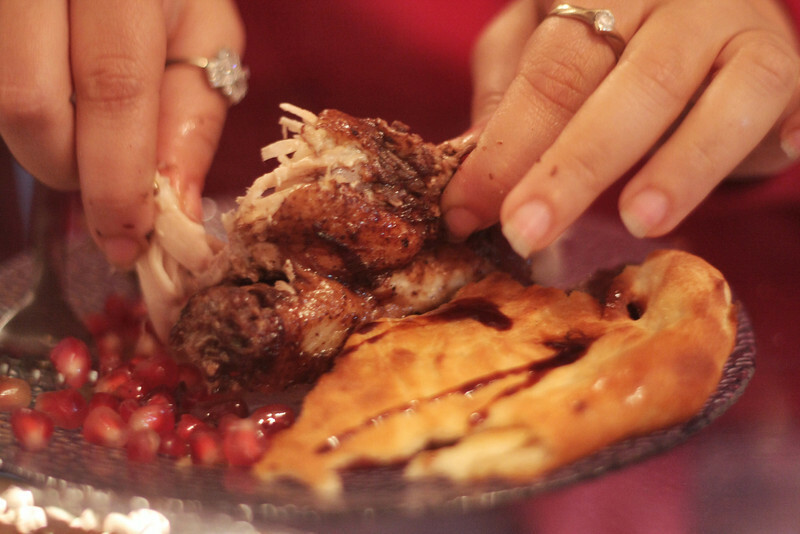 Add the chicken and onions on top, and sprinkle with pomegranate seeds. If you prefer to plate individually, just cut up the chicken (it should be very easy to do this by now as the meat will be falling off the bones) and place on a bed of bread & onions on each plate. You should probably eat this with your hands.